We were excited to find wild raspberries surrounding our campsite and decided that our breakfast would include pancakes smothered in raspberries. After breakfast our next task was to figure out how to load our boat without getting it swamped by the ferry wake. This took some timing, but the task was managed and soon our bow was pointed down stream. Soon after we departed camp, a large steamboat lay in ruins on the left bank. Most of the wrecked steamboats are long gone as the river during flood stages has torn them apart. On the right side was the First Nation village of Moosehide. It was abandoned at one point, but now there are individuals living there year round..
We pass by hillsides of fireweed, unfortunately our camera does not do it justice. Must have been some major fires in this area to have this much fireweed in bloom. The day is sunny and the clouds magical. The miles quickly go by and we are immersed in the scenery. So glad that we are doing the entire Yukon, hope we still feel that way in another month. By early afternoon we are at Forty Mile. When we check out the campsite, there is no doubt that we plan to stay here. Several caretakers live here and the grounds are well kept. There are also a group of students here that are doing archeology digs. Donna was here when Ryan was in high school with his youth group. At that time the buildings were in ill repair and the grounds overgrown. 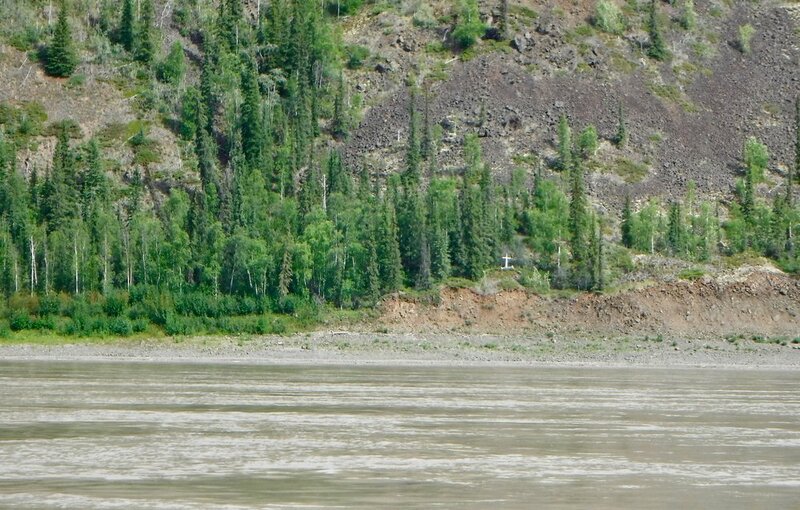 it is a different place today, It even comes with a bench to sit and take in the view of where Forty mile joins the Yukon. Can't get much more peaceful than this! As always this location is full of historic significance. As we were enjoying the view a couple of folks come in for a picnic. There is an old road that leads to this place. We soon find out that the woman is the granddaughter of the woman who runs the bakery north of Dawson. The one which we floated by and couldn't get back to. We told her that had there been a sign we probably would have tried to stop. She agreed and said she was going to make one for her grandmother. Her boyfriend works for a gold mining company. We have noticed that there is more mining going on in the area. The Yukon has treated us to another fine day. We are definitely getting into a routine. It threatened rain all last night and thought that we were going to be in full rain gear mode today. Instead, we were treated with just overcast skies until setting up camp tonight where it then poured. Interesting rock formations started out the paddle today. As the legend is told, the river at one time flowed behind these two rocks. However after years of wedded bliss in the rock household, dissent broke out and the old man kicked his wife into the distant plain and caused the river to divert and flow between them. Old Man rock is on the left. and Old Woman Rock is on the right. One of our tasks today is to fill our water containers. We have been lucky enough to fill them in the towns that we passed or by catching rain water. So far we have avoided getting water out of the Yukon which is always there if we need to. We look for small streams that flow into the river. Not real common, but often marked by fish camps. When we see a log structure, we decide to stop and check it out. It does not appear that it has been occupied recently, but there is a stream nearby that we can fill our water containers. Fish camps are often located by fresh water streams. By late afternoon we are approaching the border between the Yukon and Alaska. It is marked by flags, a silver monument and a swath of trees that have been cut between the two countries. Below the monument is a shoe that is cemented into the base. Perhaps it is from one of the early surveyors that surveyed the border between 1906 and 1907. We take our selfie looking towards our home state of Alaska. 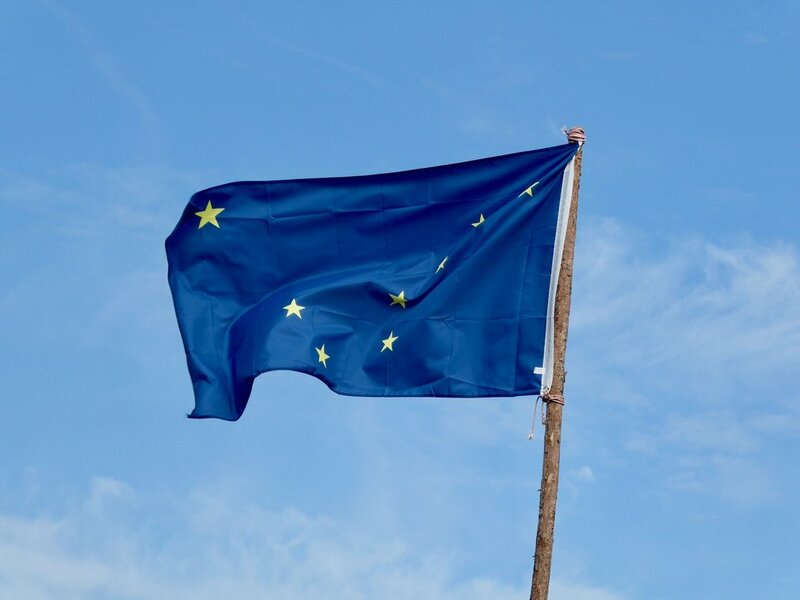 It is fun to see the Alaska state flag! 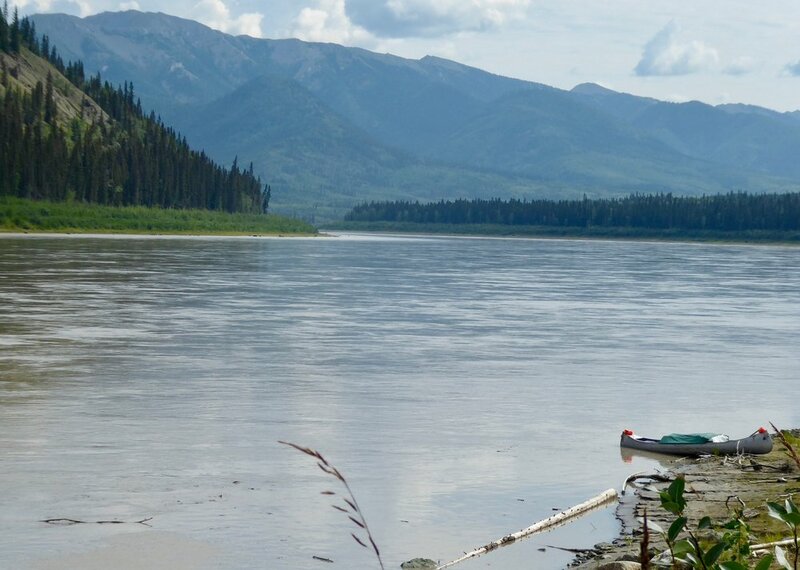 We return to our canoe and head towards Eagle where we will get a resupply of food and send back our backpacking gear. Tomorrow our boat packing should be a lot easier. Lots of rain during the night so I was able to collect some to fill our containers. We had a break in the weather this morning so decided to go ahead and prepare to leave. We were able to get everything undercover in the canoe before we had on and off rain to the town of Eagle. As we approached Eagle we were not sure where to land. In front of the main part of Eagle we saw a large steel bulwark. From our position it did not look like we could get close to the town. About a half mile before the town proper was a public landing. We had about 100 pounds of food to get from the post office and did not look forward to making several round trips. A man on a four wheeler was driving by so Don stopped him to ask if there was a nearer landing to the town. He replied by saying I never go to town but I think that there might be steps leading up to the town proper in the middle of the bulwark. We decided to chance it and making our way towards town we hugged the shore and then we saw the stairs. Looking down from the top and then off to the post office. I meanwhile put up the tarp so I can sort out the packages of food and get our gear ready to send back to Palmer. Not the best place to sort gear, but I was glad that the river level was low enough to give us some land to sort gear. 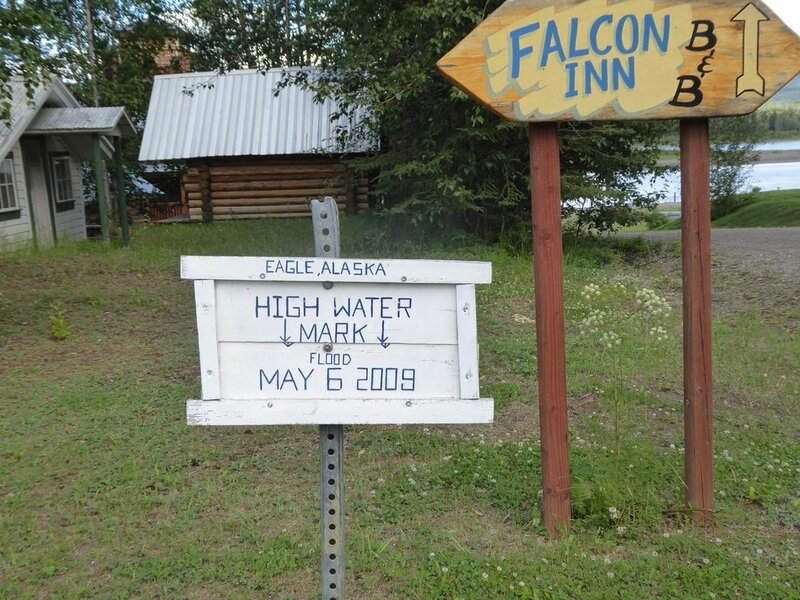 In 2009 an nice jam occurred below the town and within minutes the river rose 30 feet destroying many of the buildings in Eagle. A sign notes where the ice rose to. 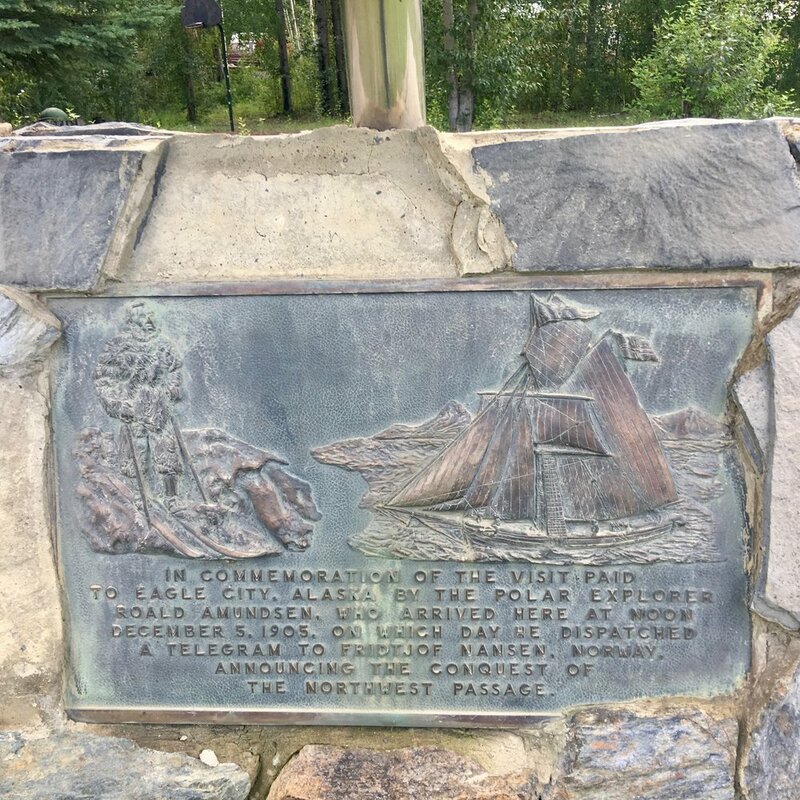 When Don gets our boxes from the postoffice, he notices a plaque telling that in 1905 Roald Amundsen arrived here on Dec. 5 in order to send a telegram to Norway telling them that he had made it thru the Northwest Passage. He had arrived here by dog sled. 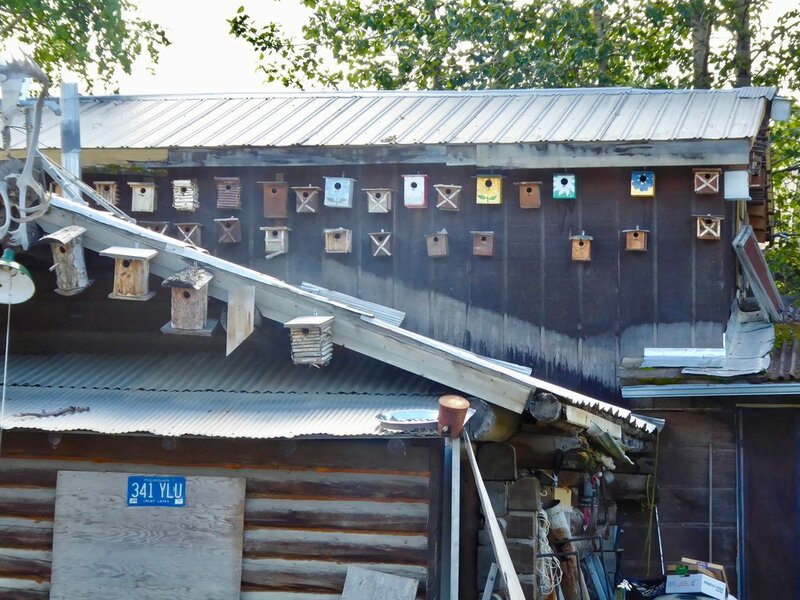 Another interesting building is the one with the numerous birdhouses. We think that it is probably due to the amount of mosquitoes that inhabit Eagle in the summer, seems to be a perfect solution to us. 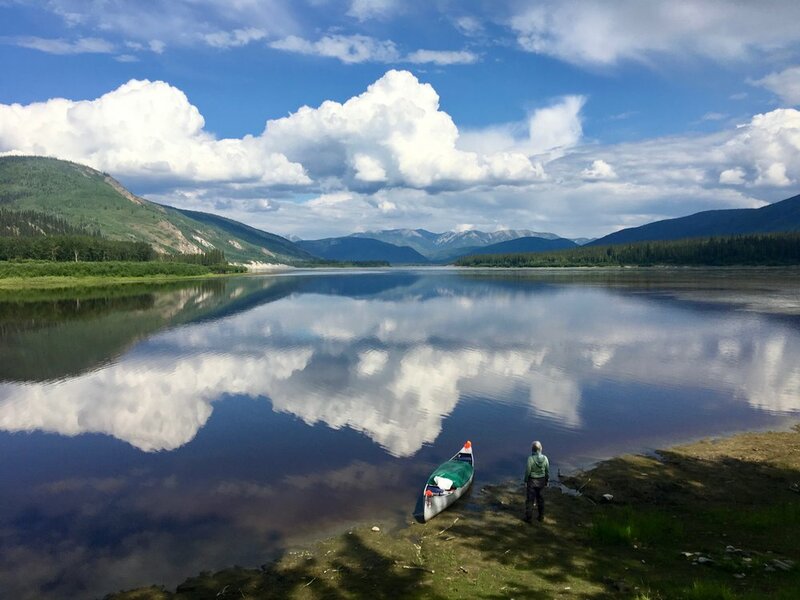 We will now be paddling till we reach Circle in what is known as the Yukon-Charley Rivers National Preserve. Days can't get much better than this. No wind, great temps and a current that just keeps flowing. The scenery is awesome, but as the river increases in size we discover that photos just can not do justice to the magnitude of the vistas. We do pass a couple of unique geological structures. First is a mountain called Calico. Looks like there are layers of coal. Which makes sense when on the other side of the river we see the mountain that continues to burn. It smells like burning coal as well. We continue to take breaks and eat lunch while floating. Our speed while paddling is recorded as moving almost 9mph. Lots of cliff edges line the river with lots of peregrine falcons perched on ledges. Lots of scenic views today. 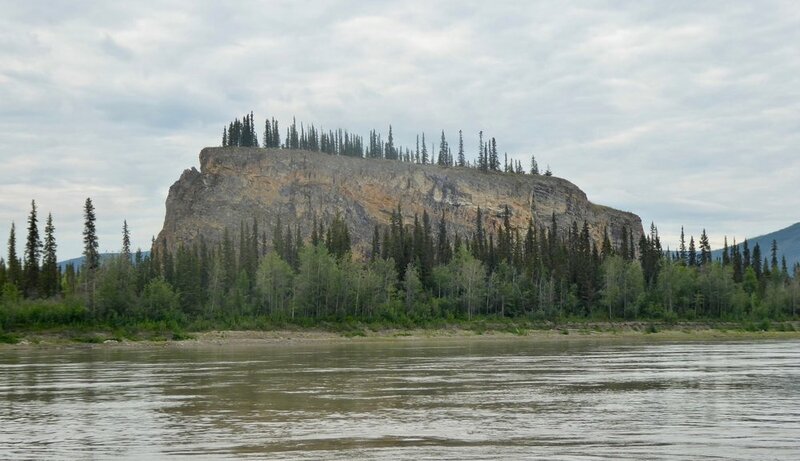 An interesting white layer that we have observed for many miles on the river was formed by a volcano that erupted more than 1200 years ago. We often see swallow nests near the formation. Notice the white thin layer among the nests. This preserve has several free public use cabins that are on a first come basis. We stop to check out the Nation Bluff public Use Cabin. The person who built this cabin died in the cabin and then it was turned over to the park service. It looks well built and has a food cache on the outside. There is a boat tied by the shore so we are assuming that it is probably being used. We walk to the cabin and knock on the door. It is indeed occupied, but the person invites us to take a look around. The food cache is nearby . Not sure I would do well with the long and cold dark winters here living in a small space. The Glenn Creek cabin is not too far down stream and when we locate it, we find it to be vacant so we unload our gear, looking forward to sleeping in a cabin. Looks like a good place to stay for awhile, but since we are not set up to be hunters and gathers, we enjoy the evening and plan to head to Slaven's roadhouse tomorrow. We depart under sunny skies, planning only going as far as Slaven's Roadhouse. Back in the day of summer steamboat travel and winter travel, roadhouses were located about every 30 miles. Some had a great reputation while others not so much. Frank Slaven in the 1930's decided to build a roadhouse at Coal Creek. He even put in extensive gardens to feed his guests. Frank, however, was too restless and dynamic to always be at his roadhouse when guests would arrive. Often he would be out on some adventure looking for gold. Anote would be left on the table welcoming the guests..Slaven's roadhouse is one of the most popular cabins in the reserve. All the bunks were filled so we were told about a public use cabin that we could spend the night. One of the employees offered to use a four wheeler to take our gear to the cabin. It was an offer we could not refuse Soon we were in a relatively new cabin complete with sheets on the mattresses. a stove and filtered water Once again we are quite grateful! A free Public Use Cabin! About a mile up Coal Creek, where the Roadhouse is located is the Coal Creek Gold Dredge. We were warned that the mosquitoes were in full force around the Dredge. We geared up only to remove all mosquito jackets due to the heat. The mosquitoes seemed to have taken refuge from the heat as well. The dredge is quite large. In the 1930's a wealthy Canadian investor researched areas to find gold. He came upon the coal creek area and decided to figure out a way to bring a gold dredge to the area. The dredge was built in Oakland CA. It was then disassembled, crated and put on a steamship to Skagway Alaska. From here it was loaded onto the White Pass Railroad and taken to Whitehorse. 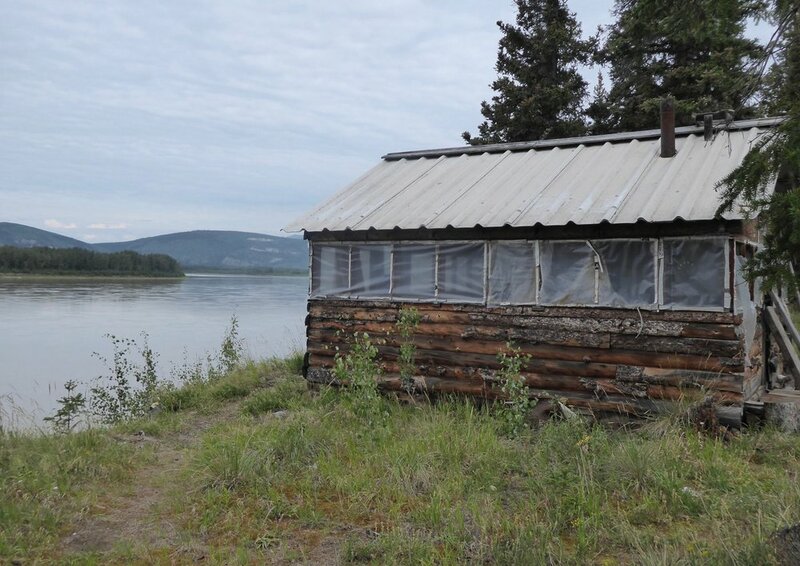 It was then loaded on to a paddlewheel steamboat on the Yukon River and taken to Slaven's Roadhouse. Upon arriving at the roadhouse a group of men unloaded the 400 tons of steel parts and began the process of moving it 7 miles up the drainage before it could be reconstructed. The dredge was bought and sold several times before the Park Service purchased it and began the restoration of the dredge. The buckets dredged up the dirt from the creek bed and then were dumped on to sorting screens. The last owners of the dredge were poor operators and the systems failed. 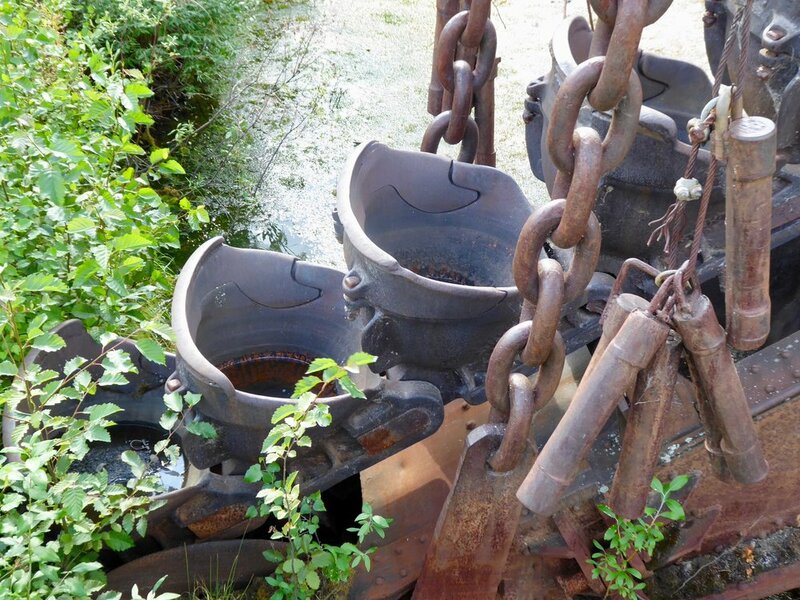 So many moving parts on the gold dredge. Sure seemed like this was a rest day for us. By late afternoon the rains began, we were able to stay warm and dry in the cabin. We pulled out the maps and began looking at the next section of the Yukon. If all goes as planned we will arrive in Circle tomorrow. At that point our mile by mile guidebook is complete and we will be using topos to work our way to the Bearing Sea. It poured during the night and several times we were awakened by the sound of rain on the metal roof. We just snuggled into our sleeping bags and were quite satisfied with our accommodations.. It was oh so easy to get out of bed in the morning and have a nice breakfast. We were able to get our canoe loaded before the rain started coming down again. The roadhouse was quiet as we carried our gear past the building. As usual the Ford team is on the water before anyone else. So thankful that we have a full spray deck. Our wildlife sightings today included a lone wolf and an immature bald eagle. So far we have not seen many mammals. From talking to other people on the river, in the summer, the large mammals move away from the river and up into the hills. The river widens and the current slows. We even are starting to get some wind going against us. We have been warned that as we continue towards the sea we may not make headway due to wind. The weather has been threatening all day. We take a shore break before the last push to the town of Circle. We know we are getting close when we see a white cross on the shore. It may be the grave of a famous trading chief, Shahnyaati who died in 1892. Other signs are fish wheels. 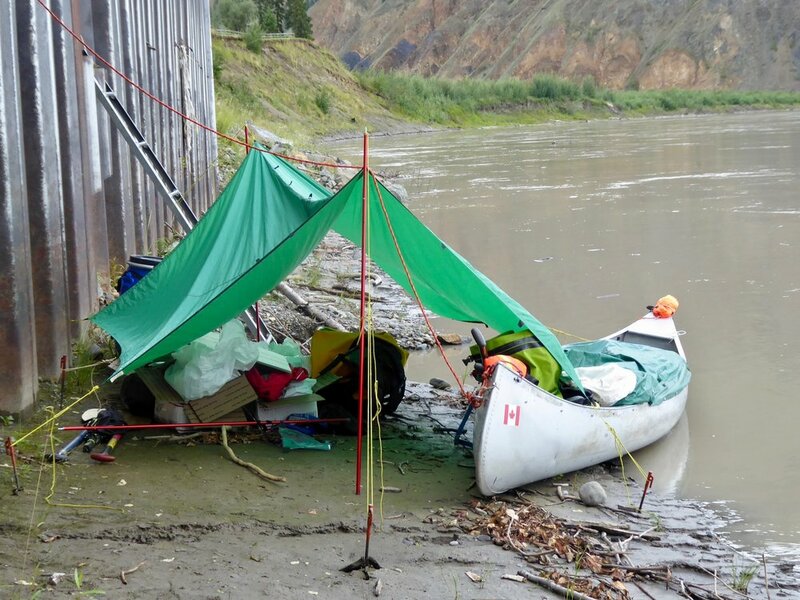 Glad we are getting close, otherwise we would probably look for a camp as strong winds are not fun to paddle against. We are beginning to enter the area known as the Flats. In this section navigation can be challenging as there are many channels some of which can add quite a bit of mileage. Our guide book ends at Circle and we are glad that we can use it to find the town. If we miss the right channel, we will miss the town. Finally in the distance we see some buildings and boats pulled up on the shore. We park the boat and walk up to see what are the camping possibilities. There is an area with a picnic table that is quite overgrown. It doesn't look like it gets much use, but it is flat and we can make it work. We set up the tent and Donna heads out to scout the town. It does not take long as the town is quite small. She finds the washeteria which has laundry, showers and water. Everything needs tokens which are found at the only small grocery store. I make it 15 minutes before it closes. We are quite thankful that we had decided not to resupply food items here. The variety is quite limited, expensive and minimal. We both take showers, do laundry and charge our devices. It has been a successful day. We check out the map, which shows us where we are and the distance yet to go looks formidable.